I have a new obsession. It is one of those all-consuming, check her blog 20 times a day, obsessions. I'm talking about Lynnderella. For those of you who don't know who Lynnderella is, she is a polish lover like you and me, who started frankening polishes for herself and her friends. Everyone who saw the polishes wanted them, so happily, she has set up shop and started selling her glitter-tastic wonders. I ordered five polishes from her current collection, Early Halloween. 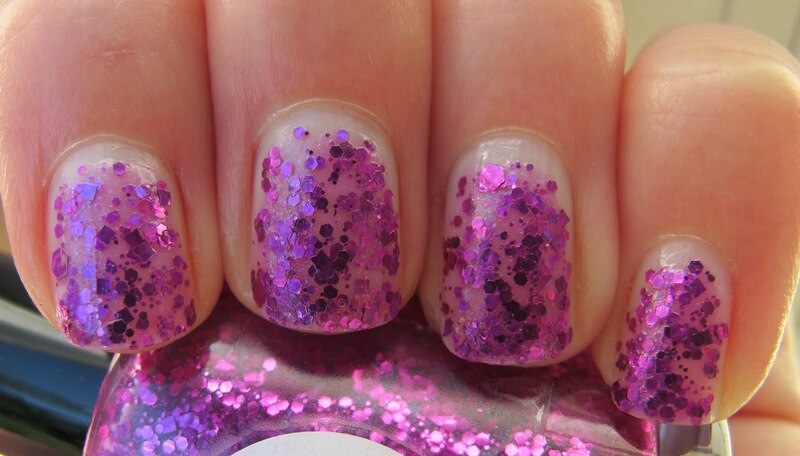 The polish I'll be showing you today is called The Telltale Heart (great name). 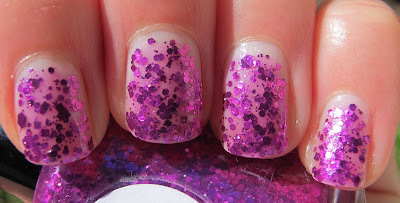 The Telltale Heart is a collection of magenta glitters in a clear base. When I say "collection of glitters", I mean it. 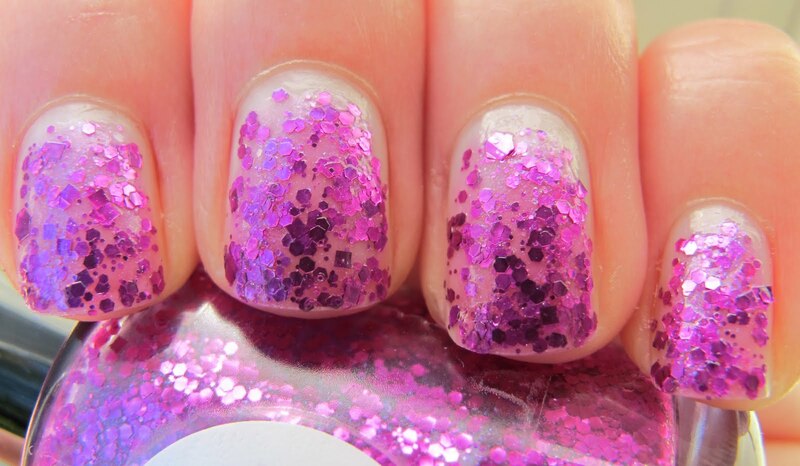 All of the glitter is the exact same shade of magenta, but there is very fine glitter, small round glitter, large hex glitter, medium hex glitter, large square glitter, small square glitter, and I believe small hex glitter as well!! It's so cool just to sit and stare at all of the different glitters! I'm sure this will be a great polish for layering, but as usual, I wanted to wear this alone first. This is four coats of The Telltale Heart. If you have suggestions for base colors you'd like to see this with, please leave them in the comments. I have a few ideas in mind myself! I am in love with this polish. This is the first Lynnderella I tried from my order, and I couldn't bear to take it off. That's why you're only seeing this one for now. I will be showing the other four as soon as I can bring myself to remove The Telltale Heart. I have received a TON of compliments of this polish so far, by the way! Just to add, once I paid for my Lynnderella order, it was shipped extremely quickly and I received it in just a few days. Lynnderella's Early Halloween collection is currently sold out. I do not know whether she intends to re-open her shop and sell more of Early Halloween or not, but keep an eye on her site just in case. Her next collection, coming in November is called Funny Money. I will absolutely be ordering from Lynnderella again!! This is a pretty awesome color. I'll have to check Lynnderella out! I have been wanting Telltale Heart desperately! This is lovely!